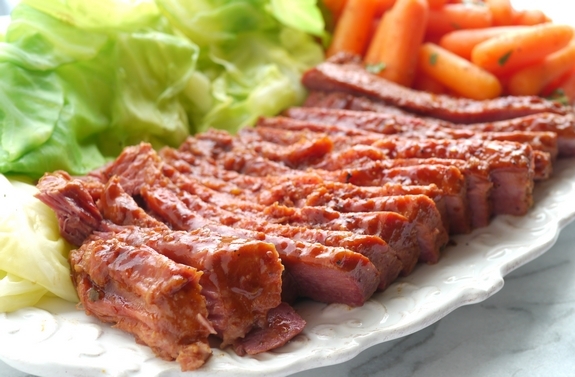 This Whiskey Glazed Corned Beef is everything you’ve dreamed about for St. Patrick’s Day. It is tender, delicious and so easy to prepare. 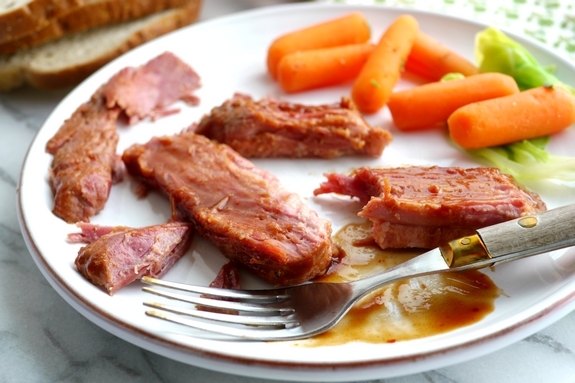 So instead of pulling out the Lucky Charms once again, as your go to St. Patrick’s Day feast (enjoy Lucky Charms Ice Cream for dessert only)…why not make this Whiskey-Glazed Corned Beef? Show your family you care (are they beginning to wonder) with a delicious, easy and traditional St. Patrick’s Day meal instead. 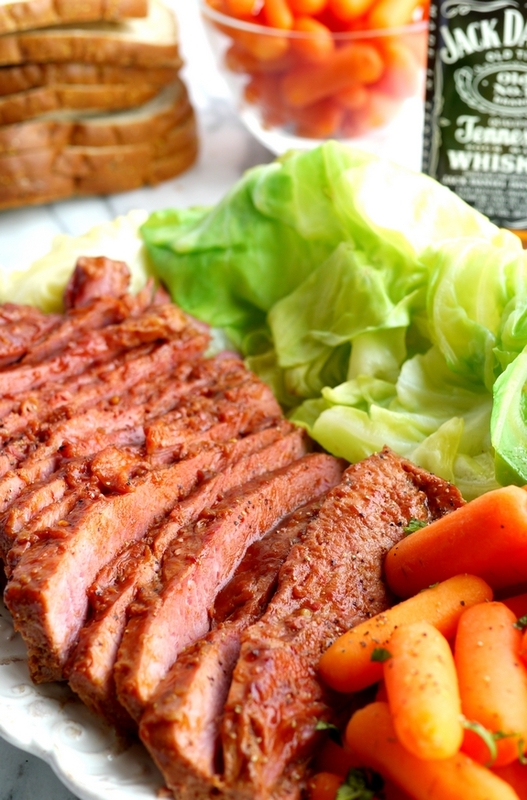 Even if you don’t like whiskey, don’t worry, this corned beef does not taste like a bar drink. The whiskey adds to the depth and complexity of flavor. Now, if you don’t like corned beef, I can’t help you there. Maybe this Guinness Braised Brisket is more your style. Just know, this is not your standard, boiled, corned beef, WE ARE GOING TO MAKE IT SPECIAL! Now, go put on your kilts, grab your bagpipes and let’s get started. Open the package and put your corned beef into a large, heavy pot. A 3.5-5 lb corned beef is what you’re shooting for here. Fill the pot with enough water to submerge the corned beef, fat side up. There will be a spice envelope inside your meat package that you can add to the pot. Bring to a boil and turn heat to low, cover and simmer for 3 hours. This much of the recipe can be done the day before and refrigerated, just keep the meat in the liquid. The next day, bring it to a simmer and continue with the recipe. Or just continue the recipe on the same day, it’s your choice. When making the whiskey sauce, do not use your more expensive whiskey selections. 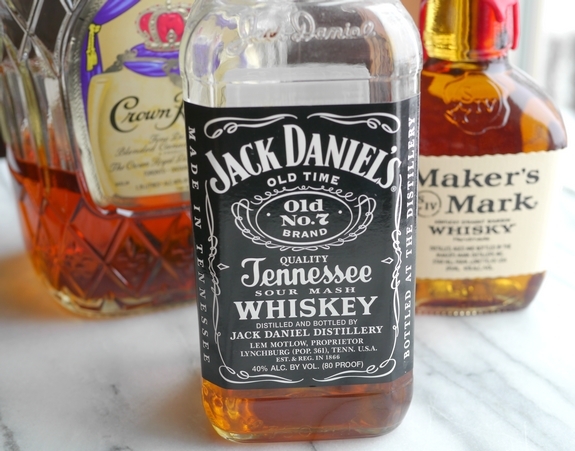 Jack Daniel’s is a perfect, less pricey choice that will add the nuances to the sauce that bring this dish to life. Did you all know that Jack Daniel is a real person? Anyone like to guess his real, first name, Jack was just a nickname. It’s Jasper. I know you will all sleep better now that you know that. Here’s what your corned beef right out of the water will look like. It’s not going to win any beauty contests soon. This is the fat layer you are going to remove. Make sure it’s fat side-up on the rack and slice the fat off with a knife. It will come right off. Paint your whiskey sauce sauce all over the slab before placing in the oven. After it comes out of the oven let it rest and slice into whatever thickness you desire. Serve with your favorite sides, mashed potatoes are also a must. Submerge corned beef, fat side up, in water, in a large pot. Cover and simmer over low heat until beef is tender when pierced with a fork, 3 hours. (if chilling overnight, keep the meat in the liquid. Bring it to a simmer the next day, then continue with the recipe). Preheat oven to 450 degrees; line a baking sheet with foil, top with a rack, and coat with nonstick spray. Transfer the cooked beef to the prepared rack, fat side up. 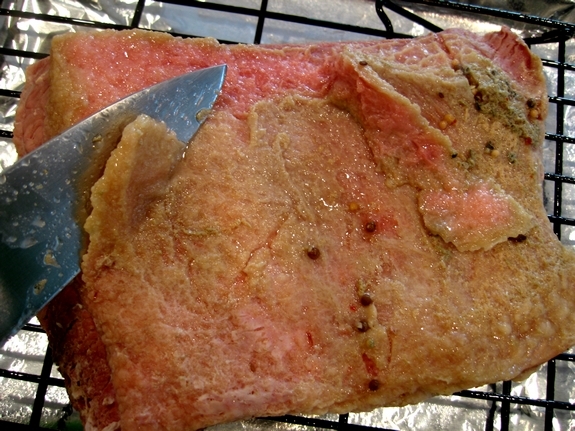 Use a knife to trim off the fat-it will be soft and easy to remove. Whisk remaining ingredients together in a saucepan and bring to a boil over high heat until thickened, 4-6 minutes. 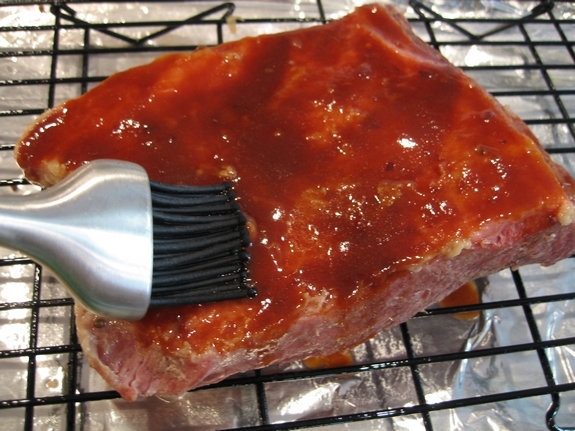 Spoon glaze onto beef, reserving leftover sauce; roast for 10 minutes, or until the glaze is dark and sticky. Remove from the oven, cover, and let rest for minutes. Transfer to a cutting board, then thinly slice against the grain. 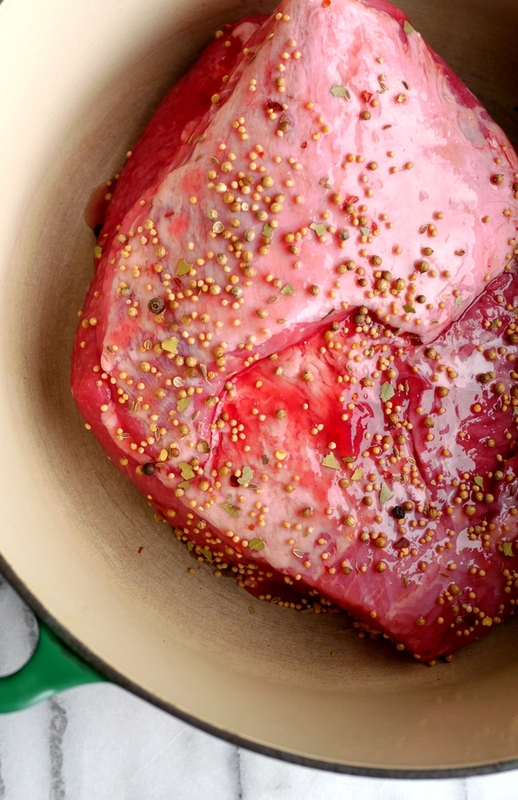 There are so many ways and methods to make and enjoy corned beef on St. Patrick’s Day. I’m actually shocked by all the creative ideas people have come up with to serve this traditional meal. 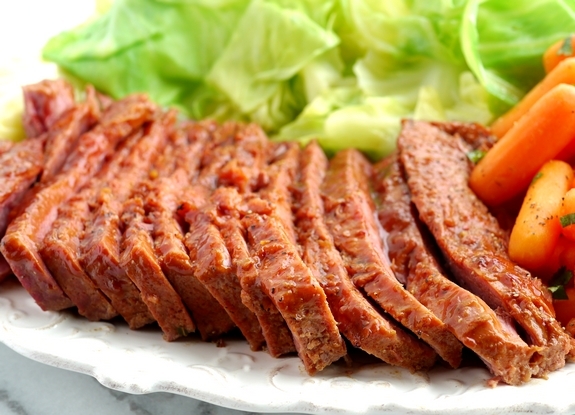 I have my eye on this Slow Cooker Thai Coconut Corned Beef recipe, it sounds amazing. 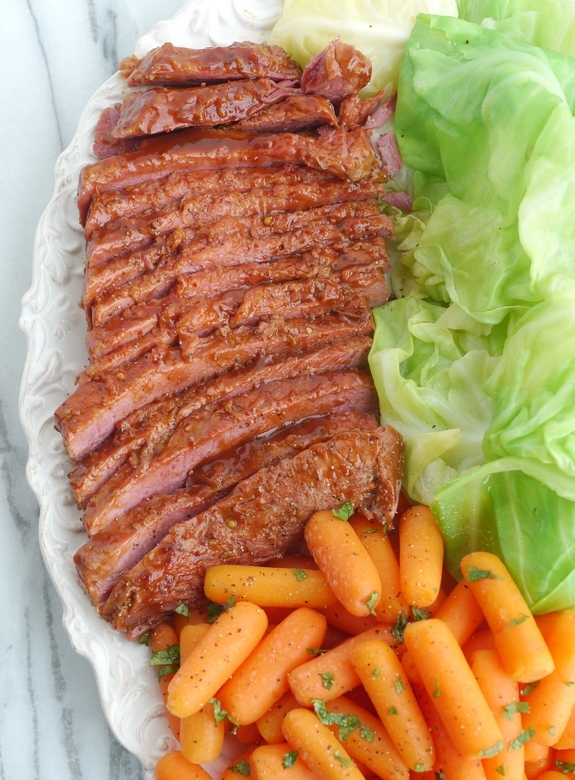 This Marmalade Glazed Corned Beef is also a version I’m curious about tasting. Maybe you want to try making your Corned Beef in the Instant Pot this year and serve your leftovers as the Ultimate Corned Beef Hash. I don’t think you can go wrong with any of these. Happy St. Patrick’s Day! Yu-uh-um. I am gettin’ on a plane…. This looks so good. We only have corned beef once a year on St. Patrick’s Day and I spend the other 364 days dreaming about it. So good! If I keep reading your blog I’m either going to get fat or become an alcoholic. Or both. OMG! That looks and sounds incredible. A cliche as it sounds, my mouth won’t stop watering! This looks really good! I can’t wait to see what is for desert! OMG this looks amazing…gross fat pictures and all. Now I know how I’ll be cooking my corned beef!!! PS~ A visit to evilchefmom.blogspot.com will take you to the 3.14 pi fest. That corned beef looks tasty! I do not recall having ever seen corned beef at the grocery store (other than in the deli section). I wonder if they will have some in now that it is St Patrick’s day? I will have to look for it. Wow, that sounds great! Too bad my 21-year old son took the last of the Jack Daniels with him. 🙁 You said any whiskey, so keeping in the bourbon theme, maybe Wild Turkey or Crown Royal will work just as well. Oh Cathy! You’ve done it again! I’m making this for the superbowl, along with the jalapeno popper dip. I cant wait! I had all the ingredients for the glaze in my pantry already so this will be super easy and as all of your recipes, super tasty!